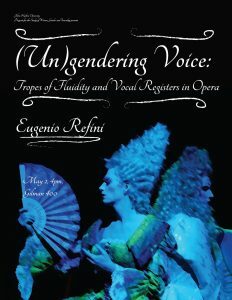 Our final WGS colloquium talk of the semester will be our very our Prof. Eugenio Refini of GRLL, speaking about “(Un)Gendering Voice: Tropes of Fluidity and Vocal Registers in Opera”! This wonderful talk will take place at 4pm on May 2nd (Weds.) in Gilman 400, so we hope friends of WGS, GRLL, and beyond come out to partake! And we’ll have light refreshments to toast the end of another wonderful school year.